Zentangle - Time To Tangle: Winter Blues? There is nothing like a "little" Zentangle to lift the winter blues. 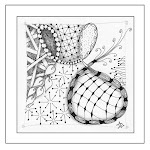 While the traditional Zentangle tile is a great pick me up, sometimes something a little larger is needed. In January, I found this to be the case. Sharpie permanent markers are wonderful pens to use on a variety of surfaces. Take a closer look at my winter project, click here: Lazy Remodel. The back corner of a closet is a great place to start if you are a bit uncertain about your first try.